Home / No G20 / #NoG20 #Hamburg: Block the Summit, Reclaim the City! #NoG20 #Hamburg: Block the Summit, Reclaim the City! One day before the final demonstration against the G20 summit in Hamburg on July 8th, there will be a mass action of civil disobedience in Hamburg. Here is the action plan for July 7th, written by the Red Zone Action Working Group: Hamburg, July 7th A disobedient mass action at the red zone. On July 7th and 8th the heads of state and government of the 20 richest and most powerful states of the world (including the EU) will convene in Hamburg to deliberate on the future of global, impe-rial capitalism. The G20 are not representing us! They will present “solutions” for global problems that cannot work because they themselves and their economic systems are the causes for these problems: for economic crises, starvation, flight, climate change, war and terrorism. “The member states of the G20 represent two thirds of the global population”, we are told, and that that is the reason for their legitimation. We object: No – the Trumps, Erdogans, Merkels, Putins and Temers of this world do not represent us. They only represent global, imperial capitalism. Facing the alleged lack of options between neoliberal capital management and authoritarian, nationalist and racist crisis resolution we choose the only right thing: global solidarity, open borders and grassroots rebellion! We want to organize an announced, transgressive action. What we are going to do will not neces-sarily and always be legal but transparent for those who want to join us. Although participating in this action thus also entails some risk we want to organize it in such a way that all those who want to take part can do so. Therefor we want to create a situation and atmosphere that is predictable for individuals and groups, that offers room for creative expression and where everyone knows what to expect. That is why we want to reach reliable agreements with those who prepare further actions that take place before, after or at the same time at different locations. Our action shall be accessible for many people so that we will be thousands that day! We want to create a public image of this action that is communicable to a broad public and of course to the residents as well. The entire city will be on its feet. 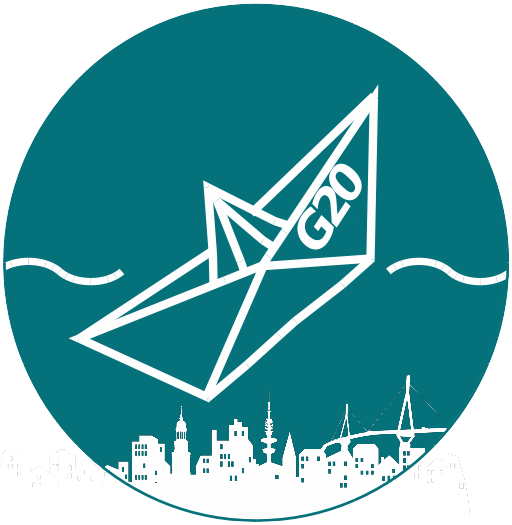 We are happy to be in solidarity with all those that share our critique of the G20 and that will help shape that day of protest with diverse forms of resistance among which we do not claim the right to sole representation. Different groups are already planning street festivals with concerts, the involvement of and communication with residents, to mark the rebellious districts with helium balloons at lofty heights, to bring the logistics of capital to a halt, decentralized actions and much more. Our contribution to a practical critique of the summit meeting will be a mass action at the place of the event. We invite everyone to get in touch with us and to participate. trade fair (Messehallen), to the City Hall and the Elbphilharmonie, shortly: to the Red Zone that will be sealed off for the meeting. Where the police will be in our way, we will find alternative paths to our goal. Where necessary we will overcome obstacles and possibly break through police chains. We will go as far as we get. Already on our way to the Red Zone we will demonstrate our societal alternatives through diverse and creative forms as raves, assemblies and the occupation of public spaces and vacancies. We reserve the right to stay overnight. Many of us will prepare themselves for the action by participating in one of the numerous action trainings. Our goal is to significantly disturb the smooth functioning of the summit meeting. Together we will reclaim the city, jointly we will encircle, disturb and block their self-righteous staging as world saviors. Because they set the world on fire. We will lock them in place because their borders take away the freedom of movement from millions of people and their police fences from a whole city. Whenever the media will speak of „access routes” on this day, they will need to say “they are blocked”. Our forms of action are human or material mass blockades. We will use creative tools like giant puppets, barrier tape, air mattresses, tandem bicycles, shopping carts, banners, umbrellas etc. We will counter this display of power with images of creative and colorful protest. Many of us will defend their right to physical integrity with body protection materials. We will not start any escalation. We will be loud, also on behalf of those people who cannot be in Hamburg that day. For many of us it is the first time to participate in a mass action of disobedience. Others were involved in the coal digger occupations at coal mining sites in Jänschweide or Garzweiler, or joined in the mass protests against TTIP. Some have been participating for years in neighborhood initiatives or are active in the antifascist movement. Others were part of movements like 15M in Spain or at the Syntagma Square in Athens and still others participated in the riots at Gezi-Park in Istanbul or in the Blockupy activities. Our backgrounds are diverse. We are union members, apprentices, students, employees, precarious self-employed workers, unemployed and pensioners. We are people with and without experience of displacement or legal residence status. We will organize our protest together in a way that our differences will be our strength. With this in mind: let’s shut down G20! / In diesem Sinne: Meutern, Entern, Kapern. G20 über Bord! #NoG20 #Hamburg Updates July 7: Live-Blog Block G20 | Enough is Enough!